Every year I have that dream…that hope…of wrapping a positive pregnancy test up in cutsie wrapping paper and giving it to my husband on Christmas morning with the video camera rolling and my family unsuspectingly watching. And this year, that dream and that hope was no different. My body is never consistent and my monthly cycles are all over the place (thank you PCOS *eye roll*). But there is one thing I can seemingly count on each and every year and that is this: it will always start a new cycle on Christmas and even Mother’s Day. It’s almost a cruel joke my body plays on me…the barren one struggling with infertility. But despite the joke, or at least consistent tradition my reproductive system has, I had high expectations for this year. 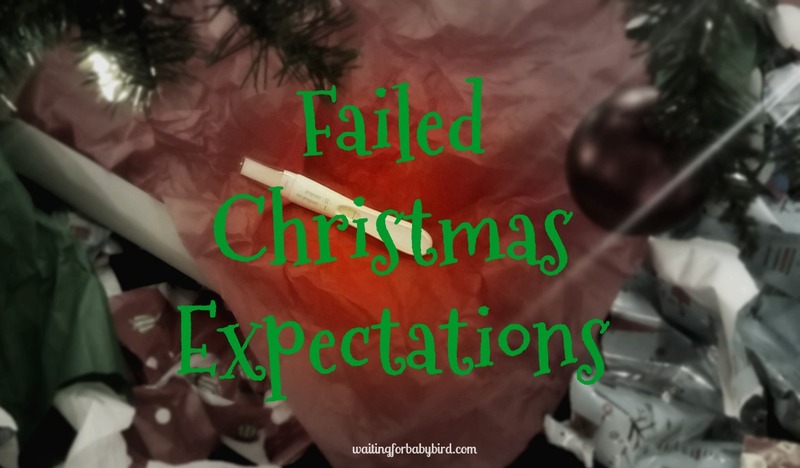 After going years without a Christmas miracle, I had lost all hope of ever being able to surprise my husband with a positive pregnancy test wrapped underneath the Christmas tree. But something felt different this year. I thought this would be the month…or at least I felt as though I had a better chance than all the others. Not to mention I had this idea in my head that it was the “perfect time” and that this was the year I would get my Christmas miracle. But as it turned out, it wasn’t. My body kept up with its yearly tradition. For hours I have been sitting and wondering, even stewing, at how God could let this “perfect time” and all the other “perfect times” I have had slip through the cracks. Have you ever been there? Have you ever had those same thoughts? I thought you might have. However just moments ago, with tears streaming down my face, I realized how arrogant I am to think that I know when the “perfect time” would be to bring a new life into the world. Because as I stop to think about it, I remember the story of Zechariah and Elizabeth in the New Testament who were old and still barren despite years of trying to grow their family. How many “perfect times” passed them by? However, having reached the age passed menopause and when children seemed like impossibility, an angel appeared to Zechariah and announced his wife would conceive a son at “the appointed time”. It wasn’t their “perfect time” to become parents because their idea of that was years earlier. For them it was back when they were younger and able to run and play freeze tag without getting tired in five minutes. Or when he was able to wrestle on the floor without pulling a muscle. But their story highlights the simple truth that our “perfect time” is not always God’s “appointed time”. God has known since the beginning of my infertility journey, even from the starting point of my life, the “appointed time” for fulfilling His plan to grow my family. The moment when I first gaze into the eyes of my baby bird will be of no surprise to Him. It’s already scheduled, and if I could see the calendar He has for my life, it would be there, circled in red with a birthday cake drawn in the box. And you know something else I am starting to learn? It’s not all about me. Because my child has a specific place in history and a specific purpose in life. And so with that comes a specific time to which they must be born. You see, God has a plan for their life just like He has a plan for mine. And as hard as it is to swallow, that plan goes far beyond bringing them into my home just when I think it’s the right, or shall I say “perfect time.” Therefore the question I am now asking myself is not “why can’t now be the perfect time” but rather, “Can I wait for the appointed time?” Can I trust God’s purposefulness enough to push aside my time frame and instead pray for patience and peace until He makes it happen? The answer is yes. It’s a slow yes coming from my mouth, but still a yes. Because I trust Him. And I know He is just as eager to watch me share my pregnancy news and then nine months later look down on me as I joyfully count each finger and each toe. Is the wait hard? Heck to the yes. But I know that it will be worth it. I also know that no matter the month, and no matter the holiday, the moment I am able to announce that I am pregnant, will be just as special, and just as magical, and just as much as a miracle as any other day of the year…including Christmas Day. Amen! The thought that my child has a specific time he/she is supposed to occupy in history is the ONLY thing that has kept me sane during the last three years! Waiting for God’s perfect appointed time is a hard lesson to learn. In the last couple of months during the times of failed transfer and delays, my husband and I were studying the Gospel of John, specifically chapters 7, 8, and 9, in our bible study. The recurring theme throughout those chapters is Jesus’ time was not yet there, and no human could do anything about it. I believe that God has long ago planned for our child. It’s hard to wait for that time, but the biggest lesson is to trust that His plan is perfect regardless of how we feel about it. Once again your words cause my heart to ache for you and your hubby. But as you always manage to do, you also beautifully focus our faith on the reality of God’s timing being perfect. Our prayers haven’t failed, it simply isn’t time for them to manifest yet. What an encouraging truth. You are such a blessing dear sister. I sincerely hope I get the chance to look you up once we get to heaven. I will count it a great honor to meet you, your hubby and all of your children some day. I do believe, no, I know, that God will give you your baby. I pray He makes your waiting easier and as short as possible in Jesus’ name. This is a beautiful post. I have shared all thoughts and while it’s a hard pill to seallow, I too had to accept that my time isn’t His time. Like you I had to acknowledge that it wasn’t just me that He was working on. Our future child would be destined for a purpose that I couldn’t begin to imagine and that child would need to be horn at a specific time to fulfill that purpose. I’ve had to embrace this as I also have pcos. We have been successful in conception thanks to God leading us to our doctors. It’s not a journey I wish on anyone and you’d think I’d be over the anxiety, bitterness and frustration. ..but I’m human and I still fight those feelings as I pray for God to guide us with our family. I wish you joy and peace in this time of waiting. Ugh, you took the words right out of my mind. Yep, I welcomed a new cycle myself this Christmas and it brought the emotions all to the surface. Thanks for sharing because I’m right there with you, waiting and praying for patience. So hard, but SO true! Thank you for this reminder. I’m so sorry Aunt Flo came on Christmas. I had the same thing happen last year on Christmas and it made me throw my hands up in frustration. Pingback: Wait Update: 12 Months – Live, laugh, love…& wait on our Little One!